The Ebac K100P dehumidifier is a powerful industrial dehumidifier designed for effective operation in extreme conditions. 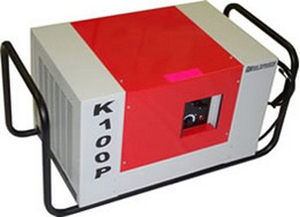 The K100P can be operated in stand-alone mode and is readily transportable from site to site. For permanent installations the K100P may be connected via duct-work to apply its power to a number of divided spaces or for improved air circulation and more effective dehumidification. The Ebac K100P is able to extract 97 pints of water per day at 80°F and 60% relative humidity but in the much more extreme conditions for which this unit is designed that rate can increase to a maximum of 20 gallons. The maximum area within which this dehumidifier is effective is 3000 sq ft (manufacturer's recommendation) making this unit suitable for larger areas. For a dehumidifier of its capabilities this unit is remarkably compact with overall dimensions of 28 x 17 x 18 inches. This makes the dehumidifier relatively easy to site in tight spaces, particularly with limited head-room, and facilitates transport from one location to the next if this is required. The K100P is portable although at 138lb it requires two to carry it. The unit has carrying handles at either end of a sturdy frame and is not unduly difficult to carry for short distances through a site to the preferred operating position. This is a dehumidifier that is designed for demanding operating conditions and is ruggedly built for the purpose. Its chassis and casing are strongly constructed from steel, which is in turn has an epoxy powder coating applied for additional protection against accidental impact damage and abrasions. Inside are heavy duty components, including a "floating" compressor to protect the unit from damage arising from on-site vibration or while being transported. A key feature of the K100P is its capability for low temperature operation. In many situations the ambient temperature in an area is too low to allow effective operation by many types of dehumidifier due to the formation of ice on the refrigeration coils which degrades performance. This unit incorporates Ebac's hot gas defrost system which actively defrosts the coils as the ice forms and enable the dehumidifier to operate at exceptionally low temperatures, down to a minimum of 33°F. The Ebac K100P can be employed as a free-standing unit, making it suitable for transfer between sites as required and ideal for larger restoration projects. The unit is also suitable for ducted installation where it is intended for long term use at a particular location. Whether free-standing or ducted the K100P is equipped for continuous drainage which can be obtained by means of a simple gravity feed to a nearby drain or by taking advantage of the integral condensate pump which allows drainage up to 100 feet horizontally or 20 feet vertically from the dehumidifier. Together with the durability and reliability of this unit this feature makes the K100P suitable for use in remote locations which may be totally or frequently unattended for significant periods. The noise level of the Ebac K100P is 66dB which is comparable to other models in its class and not excessive for a unit of its capacity. The K100P has been used successfully in a variety of applications including warehouses, storerooms, electrical & communications switching stations, locker rooms, basements, pumping stations, offshore oil rigs and active and laid up marine vessels. It can also be an effective solution for wet basements with low temperature conditions and is comparably priced to other high capacity units designed specifically for this purpose. Its minimal requirement for headroom would also suit the unit for larger domestic crawlspaces. Additional options available with this unit include wall-mounting and a purpose designed trolley for easier movement.